Poets draw inspiration from countless subjects, whether from life experiences or physical objects in around them, and Anne Bradstreet is no exception. While we walk around North Andover in her footsteps, we can’t help but wonder what environmental features we share across time. 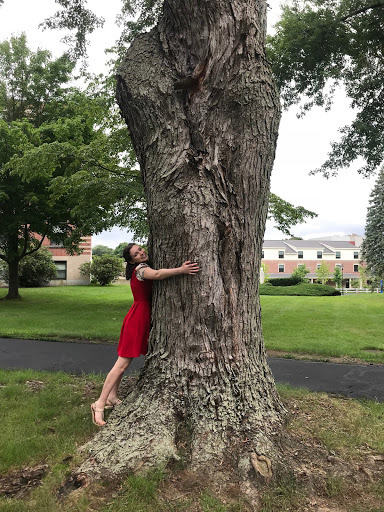 Trees come up time and time again in Bradstreet’s poems, and they are very present on and around the Merrimack campus as well. Which trees shaded the dirt walkways the Puritans strolled on sunny afternoons and which ones never made it to the saw mill? We decided to set off on our own sunny afternoon stroll and see which trees that still stand on Merrimack College’s campus would have been around during Anne Bradstreet’s days—trees that may have inspired this great American poet. Can you count the rings? Of course, we opted for the less invasive approach. There are two common methods to estimate the age of a tree. The first method, the most well known, consists of counting the rings on the inside of the tree. This method is very invasive and would require the tree to be cut down--something we do not want to do. The second method is not invasive at all and merely requires a measuring device, some simple math, and identifying the species of the tree. We selected two of the largest trees on campus to measure and estimate their age. We collected leaves from the two trees and used a form from the Arbor Day Foundation to identify the species. Each species of tree has its own unique features and rate at which it grows. According to the form, tree Number 1 was a Norway Maple, according to the form and Tree Number 2 was a Silver Maple. After identifying the species of tree, we measured their circumferences. Not knowing how high up to measure, we consulted the City of Portland, Oregon's website which advised that “the tree diameter [should be] measured at 4.5 feet above the ground.” We didn’t have a measuring tape on hand, so we wrapped a piece of blue painters tape was wrapped around each tree, marked it, and brought the tape back indoors to be measured. Then, we were able to calculate the results found below, following this simple method. The circumference is calculated by measuring the perimeter of the tree. The diameter is then calculated by taking the circumference and dividing by pi. The growth factor was found using a chart from “The Living Urn,” which displayed the growth factor of many species of trees, including the Norway Maple (4.5) and the Silver Maple (3.0). To calculate the estimated age, the growth factor is then multiplied by the diameter of the tree. After following this method we were able to determine that the first tree has been around since approximately 1492, and the second tree has been around since approximately 1600, meaning both of these trees were alive during Anne Bradstreet’s lifetime. In the future, it would also be interesting to see just how many of the trees across Merrimack’s campus existed during this time period. It is truly remarkable how old these trees actually are and how much history they have been through. Puritans viewed nature very differently than we do today. They viewed nature as an enemy—a place where evil resided. They believed nature, represented the dark evil in human life. To them, the unknown wilderness and their fear of indigenous people, witchcraft, and the devil went hand in hand. Anne Bradstreet’s poetry shows a marked contrast to this fear of nature—Much of her poetry focuses on and is inspired by nature. Unlike many of her Puritan contemporaries, Bradstreet often viewed nature as a kindred spirit rather than an enemy, and sought out solace, peace, and inspiration from it. A lonely place, with pleasures dignified. As seen in the above passage of “Contemplations,” Bradstreet admired nature for its greatness and longevity. She imagines, that if “if the sun would ever shine” she would choose to stay in such an environment—one where she feels comforted and at peace with herself. Many modern readers feel distanced from Bradstreet’s writing due to her Puritanism, however, passages like these serve as wonderful reminders to twenty-first century readers that Bradstreet wasn't all that different from ourselves. Bradstreet experienced severe illness, and suffered heartbreak and hardship throughout her lifetime. To alleviate her day-to-day struggles, she sought refuge in both nature and her art. And so, into the woods Anne Bradstreet went to hone her creativity. We are lucky to be able to walk the same paths she once did and, as a result, form a deeper connection to our poetess and our own natural environment. Taylor Galusha is a Political Science and English double major at Merrimack College. She enjoys reading anything—from classic Shakespearean plays to true crime novels and everything in between. She enjoys music, painting, and photography. She loves her dog Brady dearly and is a Disney Enthusiast. She plans to attend law school after graduating from Merrimack in 2020.